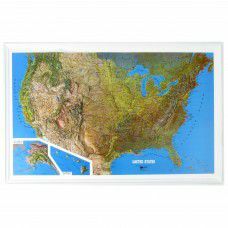 The medium sized USA raised relief map shows all 50 states with Alaska and Hawaii as an inset in the lower left corner of the map. Prominent features include the Appalachian Mountain chain and the vast mountainous and high desert areas of the west. Rivers, towns and state borders are marked. The scale is 1" = approximately 100 miles.